Craterosaurus a not very well known stegosaur. The animals name means crater lizard. Interesting animal, though I prefer kentrosaurus myself. That might just be a bias because of my younger years spent watching the Dino Riders cartoon, though. Regardless, these animals are very neat. I often wonder what it was that pushed them to evolve the spikes rather than the wide plates sported by animals like stegosaurus. 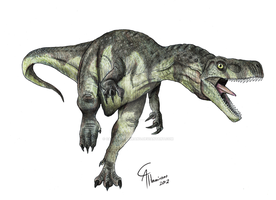 Plus, kentrosaurus has those fantastic shoulder spikes sticking out too. It's just such a unique critter. Great work! Good old stegosaur of the EK! love your work, you amaze me. That is pretty much totally badass. Where was this dinosaur found? same place as Africa where Kentrosaurus lives. No, it was found in england. Only a vertebra is known from it. cool, im a fan ot kentorsaur-like stegosaurs, really cool dinos and you did a great job on this piece. yes I also like that very much. But we dont know if it was like that in craterosaurus, fossils of this animal are very fragmentary. Did they at least find the skull or just a few leg bones and ribs or something?